2011 started out robustly amidst signs of global recovery with the US economy recording a 3% growth in the last quarter of 2010. However, global outlook began to deteriorate with the rise of civil unrest in North Africa and the Middle East region, which resulted in rising fuel prices. The devastating earthquake, tsunami and nuclear incident in Japan as well as massive floods in Thailand further disrupted the supply chain causing major concerns for much of the year. The worsening Eurozone debt situation that spread to larger member states, such as Spain and Italy in the final quarter of 2011 did little to improve global market confidence. Despite the challenging global environment in 2011, Malaysia has remained resilient due to diversification of the country's trade exposure to developing and emerging markets such as China and India. Malaysia's total trade in 2011 reached the highest total trade ever recorded at RM1.269 trillion, an increase of 8.7% as compared to the previous year. In 2011, China surpassed Singapore to emerge as Malaysia's largest export market, contributing RM91.25 billion or 13.1% of her total export, whilst India recorded an encouraging 34.6% growth from RM20.93 billion in 2010 to RM28.18 billion in 2011. Exports to Japan also rose by 19.8% to RM79.97 billion in 2011. This was mainly driven by higher demand for all types of products to meet post-tsunami needs, especially for the construction of buildings and infrastructure in Japan. Exports to the US and EU stood at RM57.58 billion and RM6.27 billion respectively, which accounted for 11.5% and 0.9% share of overall exports respectively. The Malaysian timber sector continued to play an important role in the country's economy. In 2011, overall exports of Malaysian timber and timber products fell by 2.4% to RM20.03 billion as compared with RM20.52 billion recorded in 2010. By product, wooden furniture (including rattan furniture) remained the largest export item, contributing 31.1% to overall timber-based exports in 2011 which amounted to RM6.23 billion. Of this, wooden furniture contributed RM6.20 billion while RM25.10 million was rattan furniture exports. This was followed by plywood and sawntimber, which accounted for 25.5% and 12.4% of overall timber exports respectively. Plywood exports declined by 0.9% to RM5.10 billion while sawntimber exports declined by 2.1% to RM2.48 billion. Chipboard / particleboard made impressive progress with a 17.1% growth to RM337.9 million. This was followed by mouldings and Builders' Carpentry and Joinery (BCJ) products which grew by 5.7% and 5.4% to RM757.0 million and RM1.01 billion respectively. 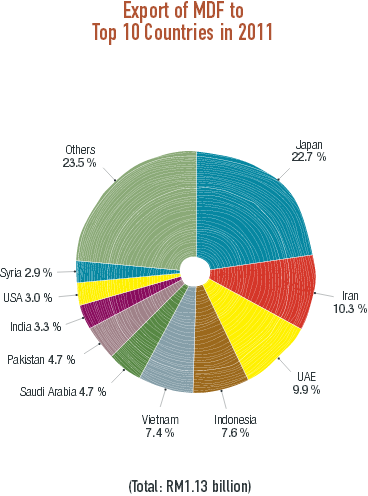 By region, Asia accounted for 64.9% of Malaysia's overall timber exports in 2011, an increase of 1.3% to RM13.0 billion. The Americas and Europe contributed 14.3% and 12.4% to overall timber export receipts respectively. Exports to the Americas and Europe declined by 12.2% (to RM2.86 billion) and 13.7% (to RM2.49 billion) respectively. In 2011, Malaysia's timber export destinations that registered double-digit growth rates were South America (up by 39.1%), Central Asia (29.0%), Central America (18.8%) and Africa (10.8%) compared to the previous year. Japan, the US and India remained the top three major export markets for Malaysia's timber products, accounting for 41.6% of overall timber export revenue in 2011. Japan retained its position as the largest market with imports amounting to RM4.60 billion or 22.98% of overall timber exports, recording an encouraging double-digit growth of 22.2% as compared to the previous year. Holding on to second and third positions were the US and India, which took up 11.14% and 7.52% respectively of Malaysia's overall timber exports in 2011. Exports to the US stood at RM2.231 billion, a decrease of 13.4% while exports to India reached RM1.505 billion, a minimal decline of 0.04% as compared to the previous year. Taiwan remained as the fourth largest market for Malaysian timber products while Australia and Singapore replaced South Korea and the UK as the fifth and sixth largest markets respectively. Exports to Taiwan declined by 5.4% to RM1.041 billion while exports to Australia and Singapore increased by 7.0% (to RM868.7 million) and 2.8% (to RM827.4 million) respectively. Being the fourth largest export item, logs contributed 9.8% of Malaysia's total timber export revenue in 2011. Malaysia's export of logs fell by 8.8% to RM1.953 billion in value terms and declined by 23.5% in volume terms to 3,316,035 m³ in 2011. Asia remained the largest export market for Malaysian logs, accounting for practically all of Malaysia's log exports. India remained the single largest market for Malaysian logs. The country accounted for 58.1% of Malaysia's log export receipts in 2011. Exports to India decreased by 5% to RM1.13 billion in terms of value and decreased by 16.7% to 1,879,196 m³ in terms of volume. Taiwan and Japan emerged as the second and third largest markets respectively, with a market share of 12.0% and 11.8% respectively. Taiwan's importation of logs reached RM235.1 million, an increase of 2.1% although volume fell by 19.2% to 386,991 m³. Japan's uptake of logs grew by 8.1% to RM229.3 million although volume fell by 17.3% to 360,495 m³. China's ranking slipped to fourth position with total imports declining by 37.0% in value to RM209.3 million and by 47.0% in volume to 390,524m³ respectively. Increased demand for Malaysian logs has resulted in rising log prices especially after the devastating earthquake and tsunami in Japan. Average log prices rose by 20.8% from RM543/m³ in March 2011 to RM657/m³ in April 2011 mainly due to increased buying by Japanese importers. It was reported that from January – February 2011, Malaysia's production of logs fell by 62.6% to 1,001,500 m³ as compared to the same period the previous year. The sawntimber sector registered a downward trend in 2011 with export value and volume contracting by 2.1% and 4.3% to RM2.482 billion and 2,083,430 m³ respectively. Asia was the leading importer of Malaysian sawntimber, accounting for 70.0% of total sawntimber exports. Total imports by Asian countries decreased by 1.9% in value to RM1.74 billion and by 4.2% in volume to 1,754,668 m³. Europe's import of sawntimber also contracted both in value and volume terms by 3.9% to RM508.8 million and by 4.7% to 197,413 m³ respectively. 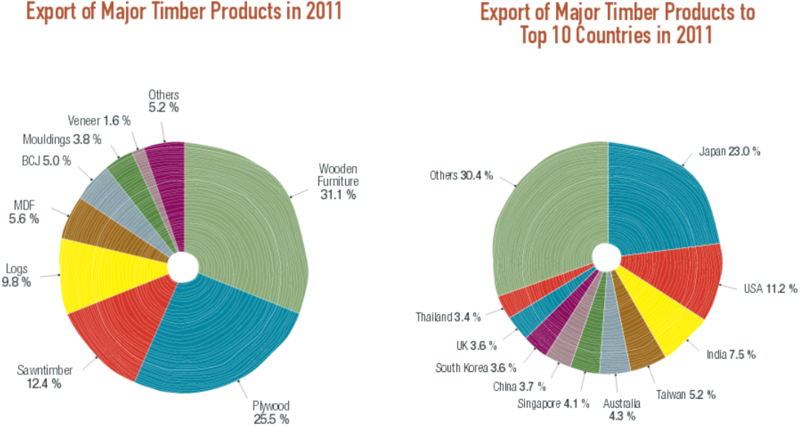 Thailand remained as Malaysia's leading importer of sawntimber, accounting for 18.7% of total export revenue in 2011. Due to massive floods, the country's uptake declined by 5% to RM463.1 million worth of sawntimber although volume increased by 2.2% to 636,776 m³. China and the Netherlands were the second and third largest importers, accounting for 10.5% and 9.1% of total export revenue respectively. A similar downward trend was apparent in the Netherlands with import value down by 5.5% to RM226.8 million and volume down by 7.1% to 82,498 m³. Germany emerged as the tenth largest importer of Malaysian sawntimber in 2011. The country imported 26,438 m³ of sawntimber, a slight increase of 0.4% although export revenue declined by 3.0% to RM66.7 million as a result of improved construction activities in Germany. Plywood was the second largest export item, contributing 25.5% of Malaysia's overall timber exports in 2011. The sector registered a downward trend with exports declining both in value and volume by 0.9% and 14.9% to RM5.10 billion and 3,170,303 m³ respectively. Asia accounted for 84.6% of Malaysia's plywood exports with export receipts reaching RM4.32 billion in 2011, an increase of 0.9% although export volume decreased by 15.1% to 2,681,394 m³. The Americas and Europe accounted for 5.2% and 4.6% of total plywood export receipts, valued at RM265.8 million and RM233.3 million respectively. Japan remained the largest buyer of Malaysian plywood, accounting for 53.0% of overall plywood exports, an increase of 4.2% to 1,496,873 m³ valued at RM2.704 billion due to stocking activities by Japanese importers. 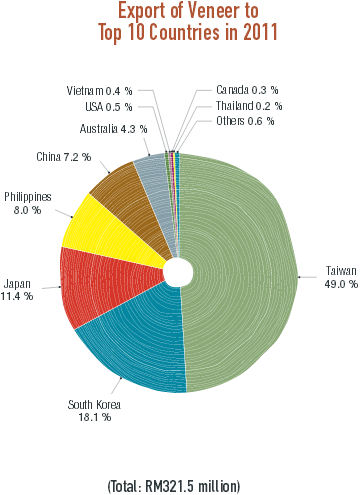 Taiwan emerged as the second largest buyer of plywood from Malaysia in 2011. Export volume declined by 16.4% to 339,778 m³ while export value declined by 14.3% to RM439.2 million. South Korea slipped to third position with total imports from Malaysia valued at RM431.1 million, a decline of 40.8% while volume dropped by 48.2% to 331,767 m³. 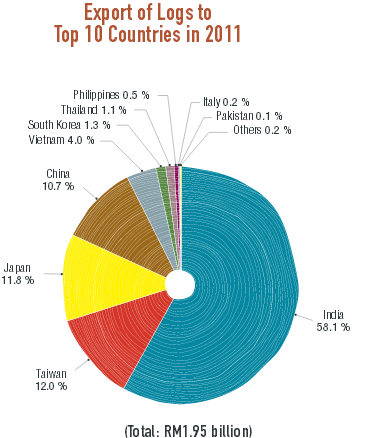 Taiwan and South Korea accounted for 8.6% and 8.4% of Malaysia's total plywood export receipts in 2011 respectively. Export of veneer from Malaysia in 2011 declined by 15.1% to 206,589 m³ while export revenue declined by 4.9% to RM321.5 million. 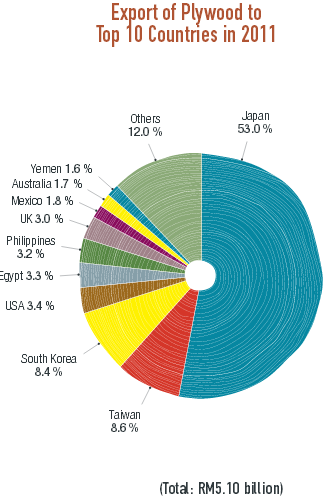 The sector accounted for 1.6% of the country's overall timber exports in 2011. By region, Asia remained the largest market for Malaysian veneers accounting for 94.9% of total veneer exports from Malaysia in 2011. Total value and volume recorded declines of 6.3% to RM304.9 million and by 15.7% to 255,199 m³ over 2010. 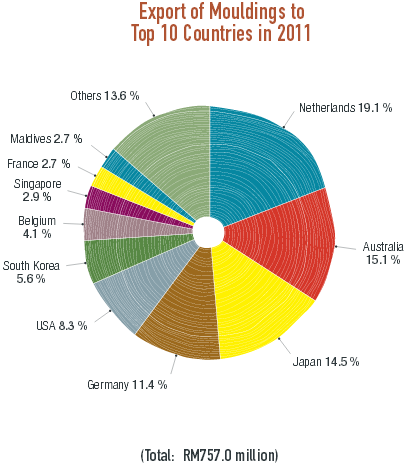 Taiwan, South Korea and Japan were the top three major markets for Malaysian veneers in 2011. Taiwan remained as the top importer with total imports valued at RM157.6 million, up 5.1% although import volume fell by 6.2% to 134,783 m³. Malaysia's export of veneer to South Korea continued its downward trend in 2011. Both export volume and value to South Korea fell by 46.7% and 40.7% to 50,621 m³ and RM58.1 million respectively. Japan, on the other hand, showed positive growth in 2011. Both export volume and value to Japan grew by 6.9% and 18.9% respectively to 18,977 m³ and RM36.6 million. Medium Density Fiberboard (MDF) contributed 5.6% of Malaysia's overall timber exports in 2011. MDF export volume declined by 10.1% to 1,111,367 m³ while export receipts fell by 6.1% to RM1.13 billion. It was the fifth largest export earner for Malaysia's overall timber exports in 2011. Asia accounted for 89.8% of Malaysia's export receipts for MDF. Export revenue declined by 5.5% to RM1.01 billion while total volume dropped by 9.0% to 1,026,471 m³. By country, Japan continued to be Malaysia's top importer, accounting for 22.7% of total MDF exports in 2011. The country purchased RM256.1 million worth of MDF from Malaysia, an increase of 10.4% although total volume declined by 0.2% to 152,282 m³. Iran and UAE were close behind, contributing 10.3% and 9.9% respectively to total MDF export receipts. Total volume shipped to Iran declined by 5.6% to 127,271 m³, valued at RM116.0 million, a drop of 20.2% year-on-year. On the other hand, shipments to UAE increased by 6.3% to RM111.9 million in value terms and up by 2.8% to 122,290 m³ in volume terms in 2011. The UAE construction industry has been recovering, with several major social, commercial and cultural projects being undertaken in Abu Dhabi. Export of mouldings increased in value and volume by 5.7% and 1.7% to RM757.0 million and 288,744 m³ respectively. 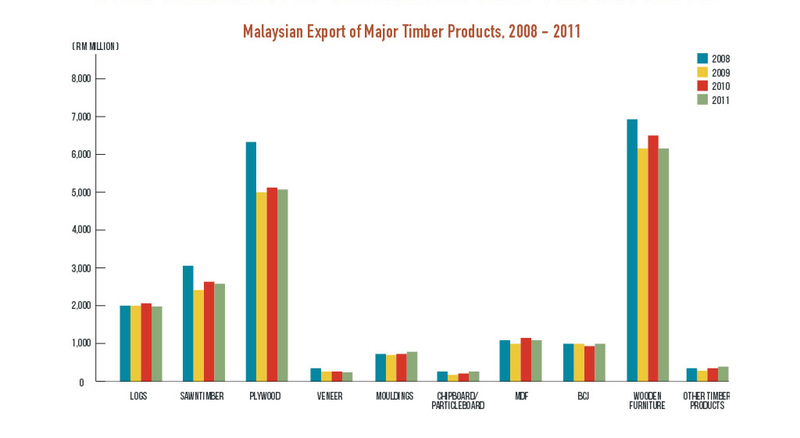 Mouldings accounted for 3.8% of Malaysia's total timber exports in 2011. 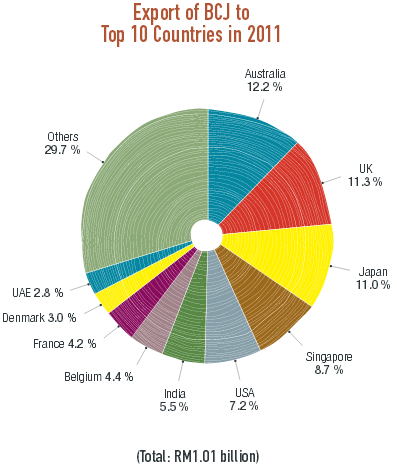 Europe was the largest market for Malaysian mouldings accounting for 43.5% of total export in 2011. However, total export volume decreased by 1.4% to 113,175 m³ although export value increased by 1.6% to RM329.6 million. This was followed by Asia and Oceania/Pacific which contributed 30.3% and 15.1% respectively to total export receipts. Export of mouldings to Asian countries increased by 4.4% to 100,093 m³ in terms of volume and by 9.5% to RM229.1 million in terms of value. Export volume to Oceania/Pacific decreased by 1.2% to 43,063 m³ although export value increased by 7.1% to RM114.6 million. 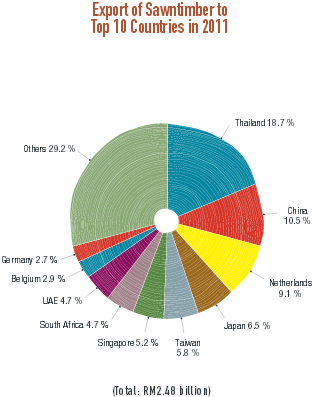 The Netherlands, Australia and Japan were the three major markets for Malaysian mouldings, with the Netherlands being the largest, accounting for 19.1% of total mouldings export receipts. The Netherlands' import of mouldings decreased by 6.9% to 45,604 m³, valued at RM144.4 million, due to reduced activities in the home improvement, refurbishment and DIY sectors. Australia and Japan were the second and third largest markets, accounting for 15.1% and 14.5% respectively of Malaysia's total export receipts for mouldings in 2011. Total purchases from Australia declined by 1.1% to 42,817 m³, valued at RM114.1 million, an increase of 6.9%. In 2011, shipment of mouldings to Japan increased by 16.8% in terms of volume and by 20.9% in terms of value to 41,773 m³ and RM110.1 million respectively. Malaysia's export of Builders' Carpentry and Joinery (BCJ) which accounted for 5% of Malaysia's total timber export receipt in 2011, improved significantly reaching RM1.01 billion, an increase of 5.4% year-on-year. By region, Asia was the largest market with total imports of BCJ amounting to RM430.5 million or 42.8% of total export of Malaysian BCJ, an increase of 10.6% year-on-year. Europe and Oceania/Pacific accounted for 33.3% and 12.8% of BCJ exports in 2011. Europe's imports of Malaysian BCJ declined by 7.7% to RM335.2 million while Oceania/Pacific's imports increased by 35.6% to RM128.9 million in 2011. 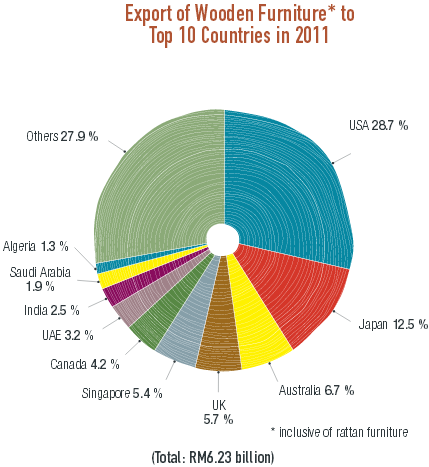 By country, Australia overtook the UK to emerge as the leading importer of BCJ in 2011. Exports to Australia rose by 37.2% to RM122.6 million while exports to the UK slipped by 13.5% to RM113.9 million. Japan increased its purchases of BCJ by 31.6% to RM111.0 million in 2011. Exports of wooden furniture by Malaysia stood at RM6.23 billion, a decline of 4.9% compared to 2010. This was the largest timber-based export item and it accounted for 31.0% of Malaysia's exports of timber products in 2011. By far, the US continued to be the single largest market for Malaysian wooden furniture, accounting for 28.8% of Malaysia's total wooden furniture exports in 2011. However, its export in 2011 to the US declined by 14.1% to RM1.78 billion. Japan was still the second largest buyer accounting for 12.5% of Malaysia's total export receipts for wooden furniture. Exports to Japan rose by 27.6% to RM775.1 million in 2011. Australia overtook the UK to emerge as the third largest buyer of wooden furniture from Malaysia. Australia's imports increased by 4.8% to RM418.0 million, surpassing the UK's which declined by 21.3% to RM355.4 million in 2011. Singapore emerged as the fifth largest buyer of Malaysian wooden furniture. The country increased its purchases by 10.4% to RM328.2 million in 2011 overtaking Canada, which recorded RM264.9 million worth of furniture imports, a decline of 12.7% as compared to the previous year. UAE and India retained their positions as the seventh and eighth largest buyers with total imports amounting to RM200.4 million (down by 8.6%) and RM155.6 million (up 25.3%) respectively. Although the Indian market is dominated by locally manufactured furniture, there is a growing preference for high quality imported furniture by affluent households. Saudi Arabia surpassed Germany to emerge as the ninth largest buyer of Malaysian wooden furniture in 2011 with RM118.7 million worth of wooden furniture, an increase of 19.2% as compared to the previous year. Malaysian furniture has made further inroads into the homes of North Africans notably in Algeria. Total export of wooden furniture to Algeria grew by 60.9% to RM80.5 million making the country the tenth largest export destination in 2011. The Malaysian timber exporting sector will continue to face challenges in the next few years. Global growth is likely to slow down further in 2012 with the ongoing Eurozone debt crisis and the slowdown in the Chinese economy. The Eurozone is likely to experience another recession, which may continue to drag growth to below 2% over the next two years. Coupled with the ongoing sovereign debt problems, the Eurozone economy is forecast to shrink between 1 – 1.5% in 2012. The Chinese economy remains the bright spot in an unpredictable global economy which is expected to grow 7 – 8% in 2012-13, with growth at the lower level of 7% should the Eurozone experience a sharper downturn. As a consequence, this might also result in a lower global economic growth of between 1 – 1.5% in 2012, down from the 2.5% growth rate recorded in 2011. Recovery in the US economy may be further hampered by the expected slowdown in China's economy and recession in the Eurozone. The US economy is expected to grow by 1% in 2012, down from an expected 1.5 – 1.75% expansion in 2011. Given the present economic challenges in the Eurozone, the US and China, demand for timber products from Malaysia is likely to be affected along with the strengthened Ringgit against the USD and volatility in freight charges. However, demand for timber products in general is expected to remain robust in the Asian region especially in countries like India.